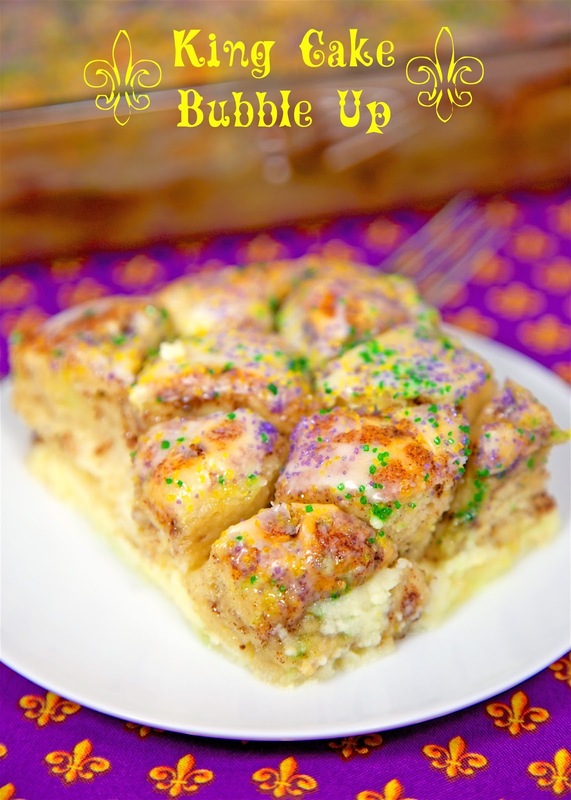 King Cake Bubble Up - We loved this!! Cinnamon rolls, eggs, milk, vanilla and cream cheese. Ready in 30 minutes. 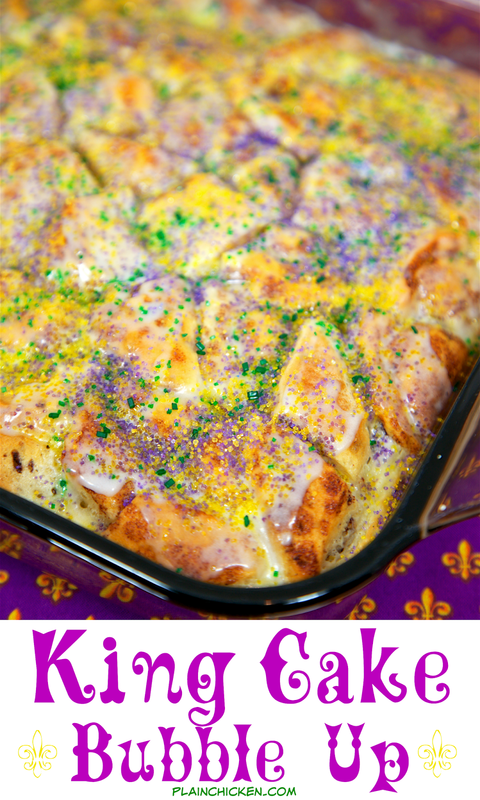 Better than any store-bought King Cake we've had! Can serve warm or room temperature. We ate way too much of this! Perfect for your Mardi Gras party! Mardi Gras is going on right now. We only have a couple of weeks until Fat Tuesday and the start of Lent. 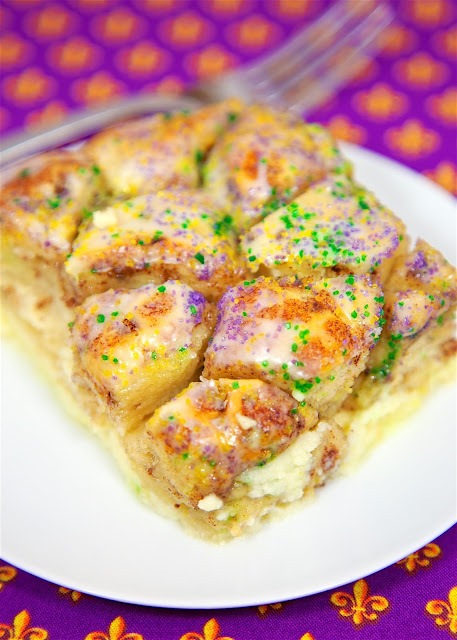 One of my favorite Mardi Gras treats is King Cake. We usually buy one at the grocery store for our at home celebration. This year I am making this King Cake Bubble Up. OMG! 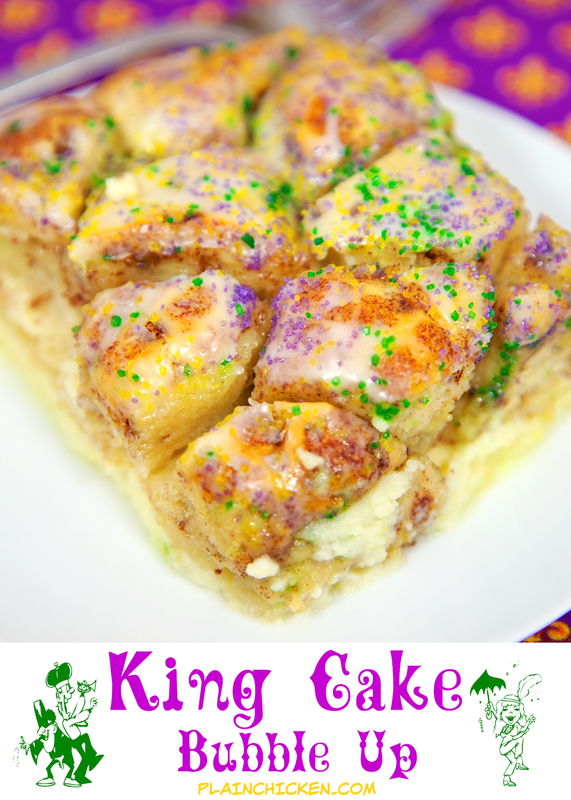 This King Cake Bubble Up is out of this world good! A million times better than the store-bought ones we usually eat. You can eat this for breakfast or as a dessert. We did both! It tastes great warm or at room temperature. If you want to make this ahead of time, I would suggest baking it and refrigerating it until ready to serve. You can cover it with foil and reheat it for your party. We didn't hide a baby in the bubble up, but you certainly can! Laissez les bons temps router! Separate cinnamon rolls, save icing to use after the bubble up is baked. Cut each cinnamon roll into 4 pieces. Place in bottom on prepared pan. Using a hand held electric mixer, beat together cream cheese and sugar. Add eggs and vanilla, mixing well. Add milk and mix until combined. Pour over chopped cinnamon rolls. Bake for 30 to 35 minutes. Remove from oven and cool for 5 to 10 minutes. Spread cinnamon roll icing over top of casserole. Sprinkle with colored sugar. 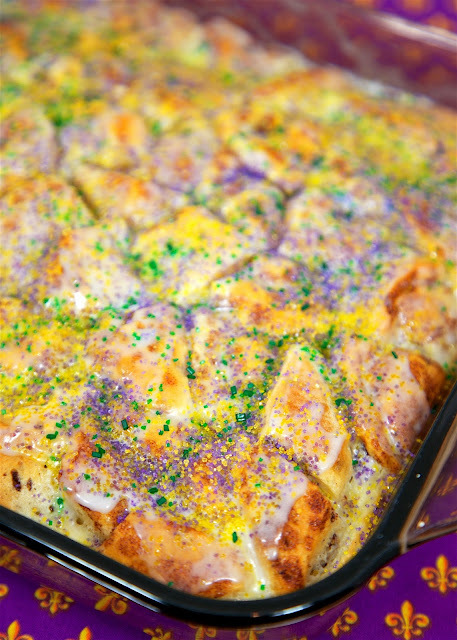 It would probably be blasphemous for me to take this to my next king cake party (I live in New Orleans) but this looks so good I may just have to do it! Does the filling go in between a top layer and a bottom layer of the quartered cinnamon rolls or just right on top? I know the recipe says on top but the picture looks different to me...and I can't wait to make this! No - you pour the filling on top of the cinnamon rolls in the pan. Enjoy!! Making this for valentine's day breakfast with pink/red/purple sugar! where do you get the colored sugar? Michael's, Hobby Lobby or Walmart have it. Where do you buy the cinnamon roll icing ???? It comes in the cans of refrigerated cinnamon rolls. Where do you buy the cinnamon icing ???? It always comes in the can of refrigerated cinnamon rolls. Is the cream cheese mixture supposed to be creamy after it is baked? I cooked this tonight and the cream cheese mixture was underneath the cinnamon rolls and was firm almost like an egg custard. I expected it to be creamy and somewhat distributed throughout the cinnamon roll pieces. Did I do something wrong? I am wanting to make this but add in some pie filling, like cherry. Do you think I would need to change the baking time? I am hoping that this will work and am excited to try this recipe! sounds good! Let us know how it turns out! 1. The pie filling was delicious. I had to bake it for about 40 minutes. 2. I used a store brand cinnamon roll that was the spiral kind instead of shaped like a biscuit like the Pillsbury ones are. So I cut the rolls into little bite sized pieces. I think this made too much breading and the cheesecake filling did not soak through. 3. I used a food processor to mix the filling ingredients. I don't know if this made it more liquidy but it was. It almost had a consistency of a bread pudding after baking. I think when I make it again, I might mix all of the ingredients slightly to make sure the cheese cake filling is all throughout instead of mainly on top. Very good. Everyone at my Bible study loved it! My husband said it was like dessert crack! I baked this today and my cream cheese mixture turned out like scrambled eggs, flavor was delicious but the texture was off. Any suggestions? Just make sure to mix the cream cheese really well. I suggest using a hand-held mixer. I haven't had this happen when I make it. If i was to make this ahead of time, at what temp and for whole long would you suggest reheating it? I'm waiting for my 1st attempt to cool. I added blueberries. My cream cheese mixture came out crumbly like eggscrambled eggs also and I mixed the ingredients well as it was liquid when i poured onto the rolls. Any suggestions? I'm not sure - I've never had that happen. This is the BEST Breakfast WE ever had!! Delicious !!!! This was delicious. I added cinnamon to the cream cheese mixture. Reminiscent of a bread pudding, the whole family loved it. I’m about to make it for my second time. Last time I cooked it, I colored plain sugar using food coloring! It worked great!! Hoping my cream cheese turns out smoother this time, I’m wondering if I need to leave the cream cheese out to soften longer! Do you think it would work in a Crock-Pot? I’m sure it would. I’m.m not sure how long it would need to cook though.